Lan Tung (Taiwan/Canada) and Volodymyr Bedzvin (Ukraine/Canada) met in summer 2016. 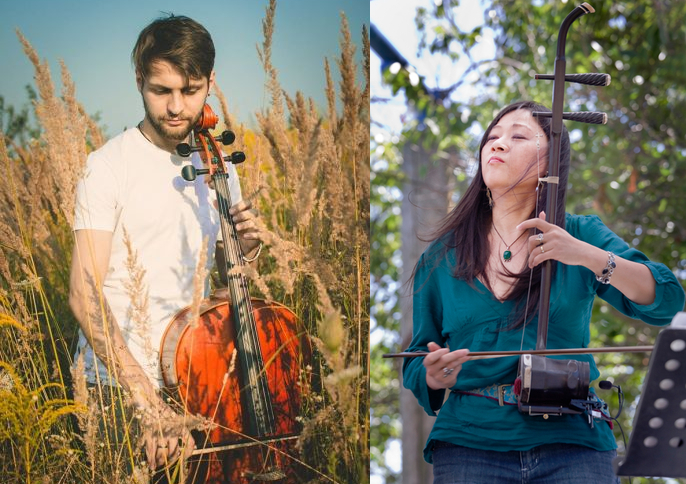 Their duo brings together some of the most expressive instruments: erhu, cello, and the human voices. The yearning sounds of the erhu and cello compliment each other well, capable of playing beautiful harmonies, graceful melodies, and energetic rhythms. Performing both their own compositions and folk music from their traditions, the duo blends passionate improvisation and evocative folk singing with solid classical trainings in a cross-cultural fusion. In intimate settings, the sounds of the erhu, cello, and voices fill the room without amplification. For larger halls and outdoor spaces, an orchestra of cellos is built on stage through looping and layering techniques of electronic processing to accompany the acoustic instruments. 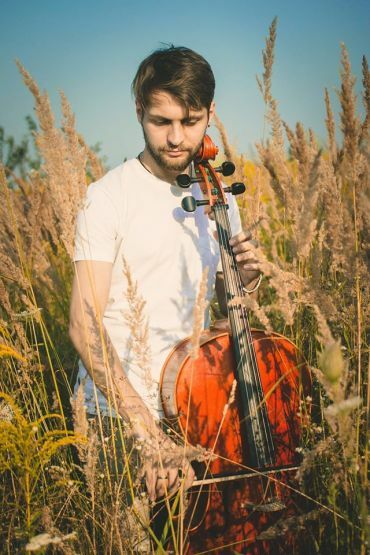 Born into a family of professional musicians, Volodymyr’s parents were members of Lugansk Symphonic Orchestra (Ukraine) and college music teachers. Volodymye started violin lessons at the age of five and the cello a few years later. As a child prodigy, he won for three years in a row the first prize of the Annual Musical Competition of Lugansk Oblast. He studied at Kharkiv Secondary Special Music Boarding School from 2001 to 2007, and performed regularly in string quartets and various ensembles and in the Regional and All-Ukrainian Musical Competitions between 2004-2007. Volodymyr passed vigorous examinations to continue his studies at the Lviv National Academy of Music, renowned for its European classical music training. However, with a growing interest in the music of our time, he began to perform and record world music, Ukrainian folk, and pop rock music with professional musicians and bands, such as Ludy Dobri, Tatosh Banda, and Mosaic. Volodymyr has performed throughout Ukraine and toured to Poland, Scotland, and Canada, in addition to his appearances at the TV show – Ukraine’s Got Talent. Volodymyr moved to Canada in 2015. Crossing between Vancouver’s new music, improvised music and world music scenes, Lan Tung is the artistic director of the Orchid Ensemble, Sound of Dragon Society, and Proliferasian. Lan has appeared as a soloist with Orchestre Metropolitain (Montreal) and Symphony Nova Scotia, and as a soloist/composer with Vancouver Symphony Orchestra, Turning Point Ensemble (Vancouver), Upstream Ensemble (Halifax), Atlas Ensemble (Amsterdam & Helsinki), and Little Giant Chinese Chamber Orchestra (Taipei). Working inter-disciplinarily, she is the music director of TomoeArts’ Weaver Woman and has collaborated with Moving Dragon (dance), Pangaea Arts (theatre), Aeriosa (dance), Flicker Arts Collaboratory (media arts), Sutrisno Hartana (Indonesian dance), and Mozaico Flamenco Dance Theatre. Lan’s compositions are released on numerous CDs, winning an International Independent Music Awards and multiple nominations by the JUNO Awards, Canadian Independent Music Awards, Canadian Folk Music Awards, and Western Canadian Music Awards. 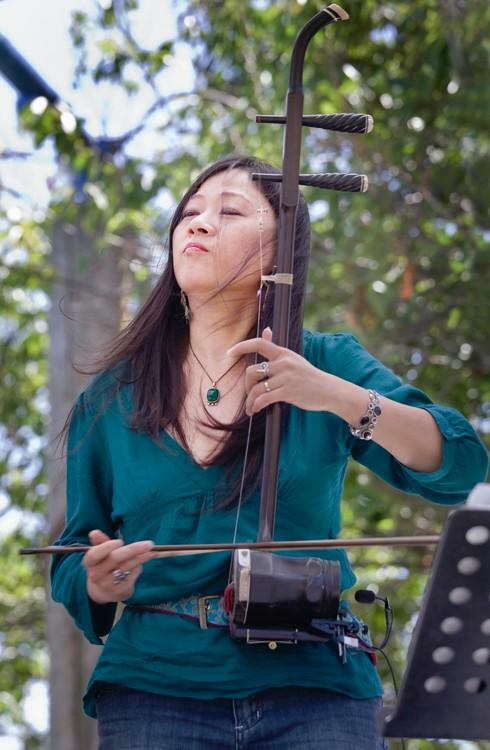 Originally from Taiwan, Lan has studied graphic score with Barry Guy, improvisation with Mary Oliver, Hindustani music with Kala Ramnath, and Uyghur music with Abdukerim Osman, in addition to her studies of Chinese music since a young age. At the Vancouver Creative Music Institute (2007-2009), she has studied and performed with Han Bennink (Holland), Barry Guy, Evan Parker, John Butcher (UK), Francois Houle, Paul Plimley…etc.